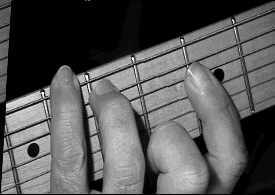 Michael: Welcome class, this lesson series covers chord theory and understanding the basic concepts of building chords. 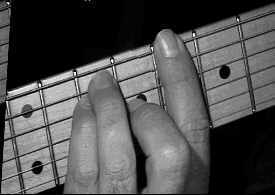 With this information you'll be able to figure out how to build chords on your own. 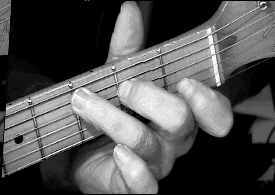 There is so much you can do with the fretboard. I will try to help you unlock this mystery. Here's the basic stage of a scale breakdown of a triad, arpeggio and chord and the various positions you can play on the neck. Michael: We will start with the key of C MAJOR: C, D, E, F, G, A, B, here's the first pattern. Michael: See all the positions of "C". This will help you visualize what is happening on the neck. When I play the guitar I visualize PATTERNS and root notes, this helps me jump from chord to chord and scale to scale quickly, this is important. OK, now the C MAJOR scale is positioned all over the ENTIRE NECK. Here's all the notes you can use, EVERY note in C Major: C, D, E, F, G, A, B will be highlighted. Michael: See all the positions you can play on the virtual neck. The "circle of 5ths" are the next stage for understanding KEYS. The next few tabs will help illustrate where you can play various C Major chords and arpeggios. Can anybody tell me what an "arpeggio" is? Rhinosaur: Notes of the chord or scale played in a row? lebaron: The notes of a chord played individually in succession? Michael: First let's break down the C MAJOR scale into 4 positions and you'll see how we get the arpeggios for each of these. Michael: Do you see how you can play various positions of the C MAJOR scale. Michael: Does this confuse anybody so far? This allows you to play scales, arpeggios and chords in various positions. 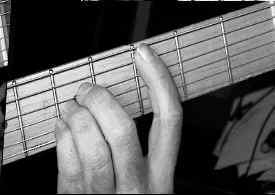 This is the secret of the fretboard, it's knowing how to find these positions and the fretboard won't be such a mystery to you. Dana: I never knew that I could do that so easy. Michael: It's simple math. OK, now we have have the C major scale in various positions. It's all patterns and note sequences, we'll get into this later in the lesson. 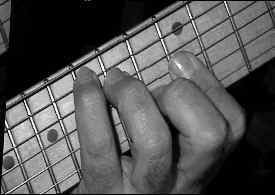 Now you know how to pick out the arpeggio notes out of the scale, C (I), E (III), G, (V). Dana: Is it always 1 3 5 ? Michael: Dana for major yes, we'll learn to expand later. Now here's how you get the arpeggios and cord positions as well, for now we'll use the basic 1, 3, 5 major. Here's the breakdown for the C major chord, arpeggio and triad. All of these are related, here's a breakdown of the terms and the scale. Now here are various positions of C major scales and arpeggios. lebaron: That's intimidating lookin', tab every chord needs a i, iii, v? Michael: Don't worry lebaron, I'll break it down for you. We will use this chart for reference and break it down into sections of chords. OK, now for the fun stuff, let's take these notes and break them down into chord positions. 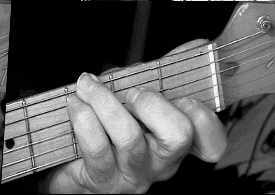 First let's use the C on the 3rd fret/5th string (A). lebaron: This is weird, you can see the shapes, like a d shape, e shape, a shape is that what you mean by visualizing? Michael: You sure can lebaron, that's is the whole idea of the lesson. Michael: OK, let's take another position using the same root note on the 3rd fret/5th string. Michael: OK, the last chord can commonly be played like a barre chord on the 3rd fret/5th string, just omit the note on the little E.
Michael: In this example we have C, G, C, E.
james: You can play C chord either way? Michael: Do you see the notes used? Michael: Now you can add notes over the C that are relative to the scale. In this example I'll play the common open C Major and add the G to the 6th string. Michael: OK, let's look at other positions. 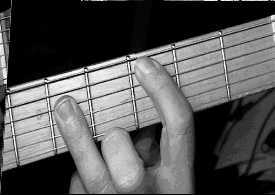 Michael: This is a common C major barre chord. Michael: See how they share all the same notes. Here's another position. lebaron: It makes me realize I need to know the names of the notes all over the fret board, I guess. Michael: If you take a look at the reference tab I gave you earlier you can come up with all kinds of variations on your own. Two things lebaron; knowing how to find a root note is one key, and knowing how to play the scale pattern is the second key point. lebaron: To be able to figure this out in other keys. Michael: Here's two last chords. Michael: The chords come from the scales, here's all the chords together. lebaron: C shape above the barre, right? You are doing great, thanks for all your help! Michael: Yes lebaron, now you can play sections of each of these chords to give an "ascending" type sound, but using all the same chords. This technique is used in jazz and classical. Michael: Now you can pick portions of each of these chords to give an "ascending" type sound, but using all the same chords. This technique is used in jazz and classical. Michael: We'll thanks everybody, I look forward to seeing you at the next lesson on Understanding Chords, bye!